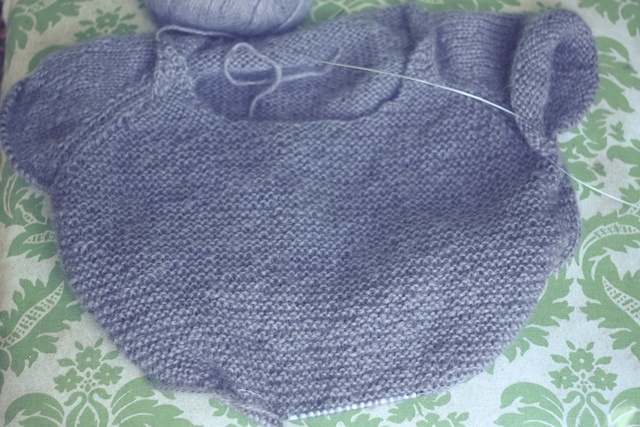 Well, I've started it three times now, but it is finally looking like a sweater. I'll tell you about some modifications before I forget them entirely. I'm using one strand of worsted Reverie, which is not as thick as the two strands of the sportweight yarn the pattern calls for. To counteract the tighter gauge, I'm knitting the second size. Hopefully, it will end up about 36". Deciding to do that took two false starts. 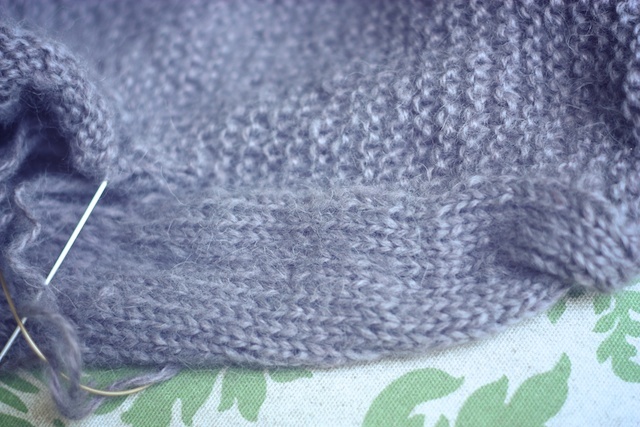 I then knit past the armholes before remembering that I wanted to make the front garter stitch like Felicia did here. I started over again. I reached the point in the neckline where stitches are cast on for the front and joined in the round when I realized I had no plan for casting on stitches to join these two different sections of garter without having a visible jog in the front. I'm sure there's a really smart way of approaching this problem before you start knitting. You know... read through the pattern... plan... that sort of thing, but I just did one of those fixes you feel the freedom to do when you're knitting for yourself. 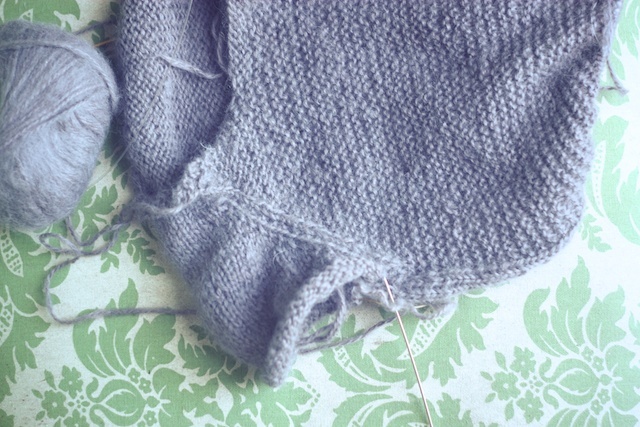 At this point the sweater is still being worked flat, with a bit of garter front section at either end of my circular. So I knit in pattern through the 18th row (a wrong side row that required purling on the garter parts) and cast on 16 neckline stitches at the end. I cut the yarn and rejoined it at the beginning of the right front garter section (which is several stitches away from the actual beginning of the round) and knit increase round 19. I knitted on through the front, joining all of the garter to make the sweater in the round. Having the beginning of the round be at the beginning of the garter lets all of the garter front be jog-less. Because the front is garter and the rest stockinette, it masks the fact that I'm one row off in one spot. Okay so I'm reading this back to myself and it seems to make no sense, already I'm forgetting the dilemma and replacing it in my mind with the euphoric feeling of reaching a long stretch of straight stockinette and garter. But if anyone out there tries a garter front on this and, like me, dives in without considering the pattern, they'll understand this fix. I swear I get past a difficult point in a project and it's like my self defenses kick in and immediately erase the frustration of the experience. The act of knitting on past the difficulty reprograms my brain. 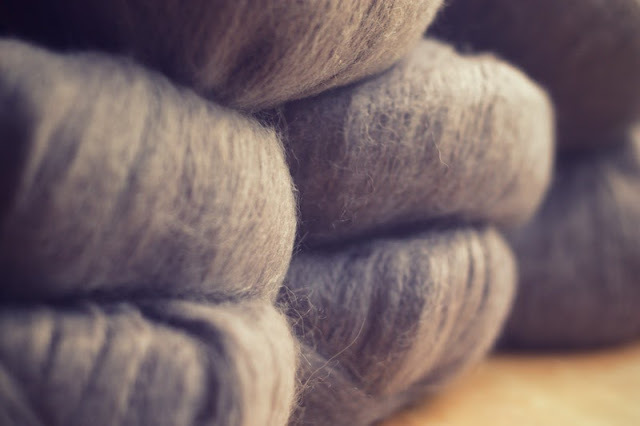 It's a knitter's mind wipe. It's the reason I can get so annoyed with a project that I want to throw it away, but once it's finished and folded in the closet, I get this glazed expression on my face as I stare into space and cast on for another one. That's going to look gorgeous on you! Thanks, Shannon! I think this is a perfect baggy, weekend sweater. Everybody needs at least one. We all have those moments of deep frustration. But as soon as the project is done, they are simply forgotten.